I’ve decided to teach physics again this fall. For high school physics I’m going to use Louis Bloomfield’s How Thing Work: The Physics of Everyday Life, the 5th edition. This book is algebra based, no calculus. I used an earlier version of this book many years ago for a college course for non-science majors and I thought it was a nice change from the usual textbook. Its been updated with more pictures and color. The labs we’l do in class will be very similar, if not the same, as the last time I taught highschool physics. I am looking to buy a few sensors from Vernier that work directly with iPads. They have a thermometer that will send data directly to their app on your iPad which would have been nice to have last year for chemistry. They also have a force & acceleration sensor which we could make good use of in physics class. They’re supposed to be out in a few weeks and the prices look reasonable, with some as low as $50. The last time I taught physics (two years ago) we used Light and Matter by Benjamin Crowell and I just saw he has a Conceptual Physics textbook on his website so will recommend that to my students as another text to look at. Crowell has both of these available on his website as pdfs that you can download for free. I also recommend the students get the Cartoon Guide to Physics by Larry Gonick and a nice lab notebook. I’l also be teaching a physics class for younger kids (11-13 years old) using Science Fusion Module I (Motion, Forces & Energy) and Module J (Sound & Light). You can buy these books from Amazon for $15 or less or buy them as part of a homeschool package on the Homeschool Buyers’ Co-op for roughly $37 each and you’l get the book and online access to digital resources, including an inactive book, labs, etc. I used these books back in 2013 so I already have all the materials downloaded which will make my life easier. These books are soft covered books and the students are meant to write in them as they go through them. Not quite a workbook, but enough to hopefully keep kids engaged and the online access is worth it if you’re kid prefers learning on a computer or might have trouble reading it themselves. These classes will start near the end of August and I will post about the labs and activities we do after each class. Every year I search and search for the perfect homeschool planner….and I’m still looking. I use Circus ponies notebook for most of my record keeping and some forms I got from donnayoung.org for most of my planning. But I just took a look at the new set of free planner forms from 5J’s website and it looks really good. It has over 200 forms, many are just variations of a particular form, but there are a lot of good looking forms there. I like that they’re not over frilly and no bible quotes so they are secular! Check it out if you, like most homeschool parents, are still looking for the perfect forms, odds are good you’l find at least a few useful forms. 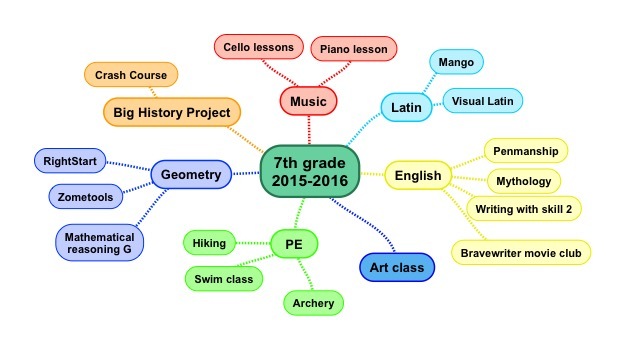 Mind mapping and this year’s curriculum picks. 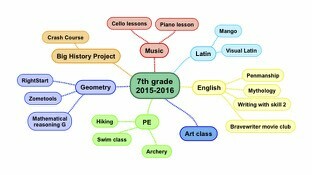 Last year, one of my students did a presentation using a mind map – I hadn’t really seen them before and I loved it. I downloaded an app that would let me make mind maps on my iPad, SimpleMind+ and of course the first thing I did was make one for each boy and his school work. 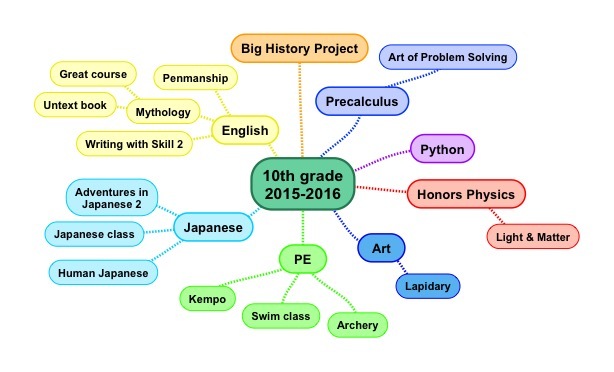 Here are the plans I have for this coming school year that I made in the SimpleMind+ app. The 7th grader is going to use Big History as his science and his history, while its going to only going to count as history for the 10th grader since he’s already doing Physics. It looks like a lot of English for the 10th grader, but the writing with skill and penmanship is stuff we’l just do once in a while, the main thing he’s going to be doing is reading mythology from the Mythology Untextbook website and listening to a Great Course, Myths in Human History. Python is thrown in there because we’l be doing some modeling for the physics class and he requested it. We used to take Japanese together but the 7th grader had had enough and decided he wanted to learn Latin, which is probably a good choice since he’s interested in the history of language and linguistics. The Visual Latin was on sale at the Homeschool Buyers Co-op so I got that for him since I’ve never studied Latin. He did the Excavating English curriculum last year, which was pretty good – I learned quite a bit.